Imagine a fastidious cat walking slowly along the top of a centimetre wide fence. Each paw is placed carefully and the cat’s tail is raised helping it to balance. It is this fine balance that Anne Jakubiec (pictured left) was looking for when she launched Four Paws Wines. Anne changed careers eleven years ago from the medical profession to wine. She has achieved success in exporting wines in bulk to Europe, and sourcing ‘own label’ wines for customers such as Threshers in the UK. 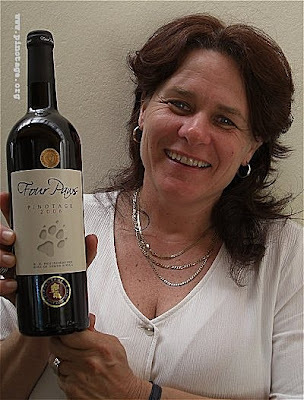 But Anne hankered for her own wine label, so with the help of a few friends, Four Paws Wines came into being, producing just 2000 bottles in their first year. “Our CEO is Felix,” (pictured right) she told me Felix is the fine cat that owns Anne, and the labels carry Felix’s signature in the form of his paw print. 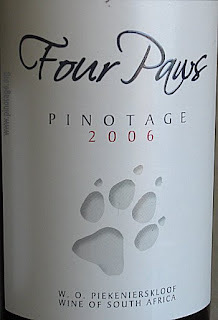 Four Paws 2006 Pinotage shot the label to fame by achieving a 2007 Pinotage Top 10 win on its first vintage. Anne is lucky that one of her friends is Gerda Willers, winemaker at nearby Allée Blue, and Gerda acted as winemaking consultant. The grapes came from the same Piekenierskloof farm in Olifants River region that Allée Blue has had much success with, including two Top 10 wins. My first impression of this wine is its delightful scented floral nose. In the mouth it tasted soft and creamy, offering strawberry and dark cherry flavours with a touch of black chocolate followed by a really spicy and citrus uplift in finish. This wine is nicely balanced and feels medium bodied, not showing its claimed 15.5% abv. A really enjoyable wine. Anne warned me that the wine needed decanting, but I forgot to do so and the sommelier at the Gordon’s Bay Spur steakhouse didn’t offer the service. 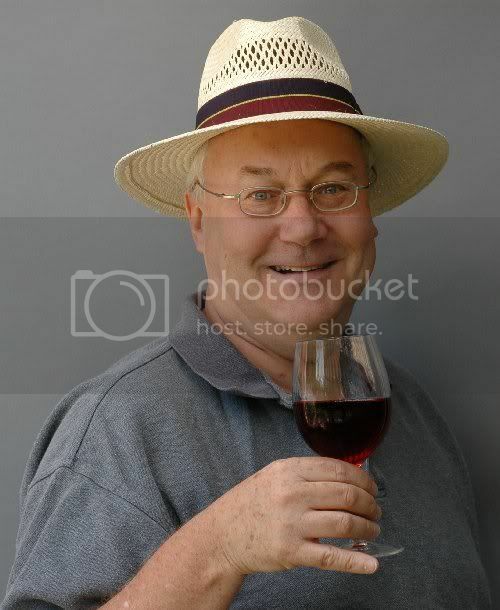 I’d just chilled it, confusing the waiter into thinking it was a white wine because “red wines are warm”. Most enjoyable as this wine is, the alcohol level which is actually 15.75% abv, is a concern. I like the sound of this one! And I really like the label too. The blogging from Africa has been great reading!